Is your garden producing obscene amounts of zucchini right now? We didn’t plant any zucchini this year, but I knew we wouldn’t go without. Our good friend is kindly sharing his never ending supply. I decided to make good use of the zucchini and bake a batch of zucchini cookies with chocolate chips and dried cranberries. 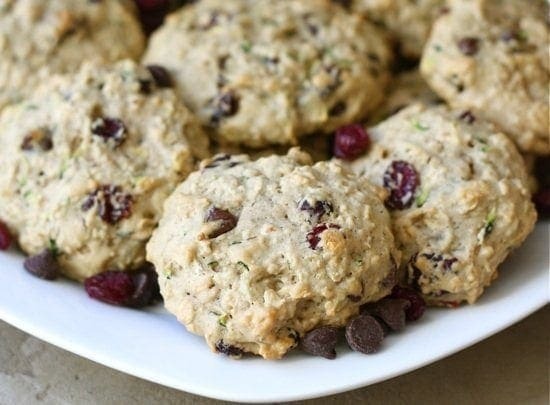 If your garden or neighbor’s garden is overflowing with zucchini, make a batch of zucchini cookies with chocolate chips and dried cranberries. You might have to hunt down extra zucchini after taking one bite of a cookie. They are that good! You will want to make batch after batch. Preheat the oven to 350 degrees. Line a baking sheet with parchment paper or a silicone baking mat. Set aside. In a medium bowl, whisk together flour, baking soda, salt, and cinnamon. Set aside. In a large mixing bowl, combine butter and sugars, mix until smooth. Add egg and vanilla extract. Next, add the shredded zucchini. Mix until combined. Slowly add flour mixture until just combined. 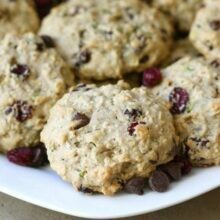 Stir in oats, chocolate chips, and dried cranberries. 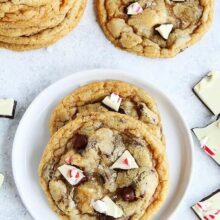 Drop cookie dough by heaping tablespoonfuls 2 inches apart onto baking sheets that have been lined with parchment paper or Silcone baking mats. Bake for 15 minutes or until golden. Remove cookies from pans; cool completely on wire racks. I just shredded and froze some zucchini yesterday. I can’t wait to try this recipe! I discovered your blog yesterday. And I’m thrilled with all the recipes you present here. I’ve never tried zucchini cookies before. I think I’ll give it a try. Welcome to our blog! Glad you are enjoying our recipes so far. Those are gorgeous little cookies! Okay, these sound totally delicious! I just posted chocolate zucchini cake, but I love the idea of the cranberries in here. I think my family would love these cookies. I will have to check out your cake. I love baking with zucchini. These cookies look great! I love the idea of making cookies from zucchini. Gorgeous cookies! I can just imagine how yummy they are! Sounds like a healthy summer treat. I’d love the frozen ones too. those cookies look great! i don’t think i’ve ever seen zucchini cookies before! yum! I bet these are yuuuuuuum! You always have the best cookie combos here Maria. Great way to use up zucchini! I’m printing this off now….I have some in my fridge I want to use up. Great idea! What a great recipe and perfect for a brown bag lunch! I love that you put zucchini in a cookie! zucchini in a cookie?! amazing! I am loving this recipe! The cookies look fantastic. I wonder what it is about zucchini that it adds something special to breads and cookies, but it does and there is a feeling that it somehow transforms that treat to something a bit more healthy…lowering the fat is a great idea. I see Mags mentioned it but I’ll repeat as so many of my friends have never thought of it; shred your over abundant zucchini and store in portion sized bags then thaw and dump into treats in the winter when you wish you had some of that zucchini lining your counter now! Love this recipe! I’ve had zucchini bread, but never zucchini cookies! Thanks for another zucchini recipe! I can’t get enough! I’ve made zucchini bread and chocolate zucchini cake before, but cookies are a great idea! Yum! These sound so good! I have never used zucchini in sweets before, but I bet these are absolutely delicious! I don’t have a zucchini plant either and yet they keep appearing in my grocery cart…suspiciously. These cookies sound fantastic! never thought to make cookies out of zucchini, wonderful! they look so good! and I thought my husband was the only one who liked frozen cookies…. These look incredible! I’m going to make these after I’m done with your Peaches N’ Cream muffins. Fabulous desserts! Yep, totally making these :). I’ve been seeing lots of zucchini cakes but never cookies! Sounds great! I’ve never heard of such a cookie but these cookies look absolutely delicious! I bet the flavors just explode in your mouth. Yum! Congrats on the new job! We really need to get together to chat about wellness. I wish we lived closer:) Let me know how the new job goes! Oh man these look GOOD! I don’ t have any zucchini this year! The ones I planted were seeds leftover from last year and none sprouted. My neighbor’s zucchini hasn’t done as well so he hasn’t had extra. I guess I will have to go buy some so I can make these. 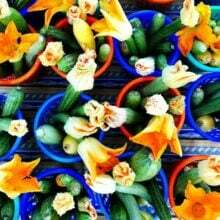 We have no shortage of zucchini from our garden this year and I am always looking for new ways to use it. I love that there is so little butter in this recipe. Oh my these look yummy! I’m definitely going to have to make these – and soon! My friend is out of town for a week and she has the most amazing garden. I know she is expecting me to pick from it and I also know she has tons of zucchini. What a great way to use it! These look absolutely delicious! I bet they taste soooo good, and they look pretty with the chocolate chips and cranberries!! I dont think I’ve ever eaten a frozen cookie before. I’ll have to try it! These look and sound DIVINE! YUM! I just came across your blog and I love it! I can’t wait to try this recipe. When I was first married 12 years ago, my mother-in-law used to bake a chocolate cake for me, which I loved. What she didn’t tell me was that it was a chocolate zucchini cake (I never ate vegetables until recently). She knew that I wouldn’t eat it if she told me that there was zucchini in it! The zucchini definitely kept it moist. These look great Maria! I just made some carrot cookies that are similar to these. I have zucchini so I have to give these a try. 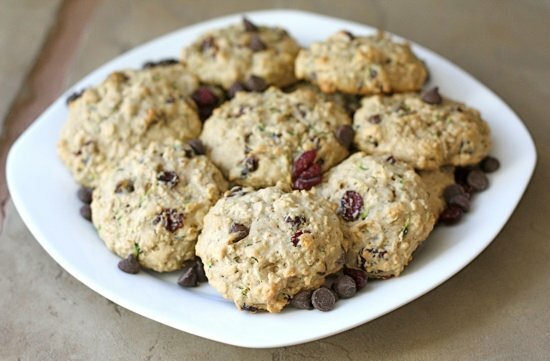 A fabulous idea to incorporate a veggie into a cookie! Thanks for another great recipe! These look so good and I love the idea of throwing zuchinni in a cookie! I’ve baked cakes with zucchini before but this is my first time seeing it in cookies! Thanks for sharing the recipe, will give it a try soon! I love the combo going on here. I’d love to make these. I’ve always got those ingredients on hand! What a fun ingredient to add to cookies! Out of my 3 zucchini plants, they produced 1! It’s been a bust this year for some reason. Now I wish they had worked out after seeing this. i believe this is the first batch of zuke cookies i’ve ever seen. lovely work! I love this recipe. I am always looking for zucchini sweets. Love these cookies! Even seems a bit healthy the addition of zucchini 🙂 Vegetables cookies! Great flavors here. Would you believe our zucchini plants actually aren’t producing this year? That’s practically unheard of! I think this year I’ve barely even eaten zucchini since we’re not overrun with it. These cookies make me wish I had some though! I made these yesterday and they are fantastic. Thank you for sharing so many amazing recipes! 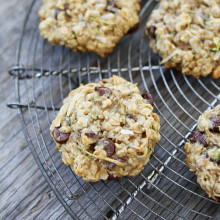 do these stand their own as simply zucchini cookies? or do you need something like chocolate or cranberries to make it work? Mmmm….made these tonight and they are sooo good. This one’s a keeper for sure! Oh these could make me really happy. I haven’t had much of an appetite lately but I would DOWN these. Would using frozen shredded zucchini from last summer work? When it defrosts there is quite a bit of liquid. When I make bread, I throw it all in and it works but I’m not sure with cookies if I should drain the liquid first or not. Any ideas? This recipe looks great! Thank you! Squeeze the zucchini in a paper towel before using, then you should be fine. Enjoy! How do you shred zucchini? Food processor? Grater? Do you peel first? I used a grater, but a food processor would work too. I did it on the medium grate. I didn’t peel the zucchini either. I made these this morning with zucchini from my garden. They are wonderful. Not too sweet. The cookies have a wonderful flavor. However, mine came out flat as a pancake. I ‘ll make again, but the next time I’ll squeeze out most of the water from the Zucchini before I add it to the mix. I had to add another 3/4 cup of flour in order for my cookies to come out like the picture. Should I squeeze out all the water from the zucchini when it is grated? Also, when I measure out a cup of zucchini, is that before all the water is drained or after? I always squeeze the zucchini in paper towels. Yes, I measure after I squeeze it. Enjoy! These are my husband’s favorite cookies bar none. I have about 12 dozen in the freezer right now. He will take them in his lunch all winter! So glad your husband likes the cookies! These little cuties are even better made with whole wheat !! I can’t bake to save my soul but guess what? I followed the recipe to the letter (except my oven only required these to bake 14 minutes) and they turned out perfect and YUMMY! She’s a keeper. Thank you! I just made these today and it’s so yummy! Mind you I didn’t have the patience to let them cool. Immediate gratification was in order and boy oh boy, they delivered! Thank you! BTW, can I freeze them? Love this idea. Do you use unsweetened or sweetened cranberries? Can’t wait to try this out for my bridge group. I have used both and both work great! I do not have dried cranberries at home. 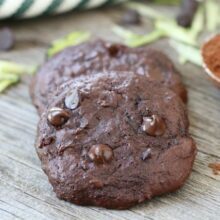 Could I sub more chocolate chips or do the cookies need the flavor of the cranberries? Just made these! They turned out wonderful. The kids helped; which makes them even “tastier”! Thanks for the recipe and a great afternoon. We will make them again, they are a big hit! Your cookies came out a lot prettier than mine, but they sure taste lovely! Tonight is the 2nd time I’ve made these cookies. Great recipe! Tonight I added a couple of spoonfuls of crushed pineapple w/ the juice and they turned out amazing. So good! Just made these with dried apricot bits instead of dried cranberries–they are amazing! Thanks for a wonderful recipe! I made both the coconut chocolate chip and cranberry chocolate chips both are great my grandsons really love them. Can you give me some ideas for freezing them to use in lunch boxes at later date. thank you so much…. Hi-glad you liked the cookies! I put them in a freezer bag and freeze! You can eat them right out of the freezer or let them come to room temperature. They are good both ways! I’m obviously a bit behind in discovering this… but a big thanks for sharing this recipe! I gave it a try this weekend and these are delicious!! Feel free to check out my blog post with pics of my experience. Thanks again! Fantastic!!! I just finished making these and they are a huge hit. I followed the recipe to the T and I wouldn’t change a thing! My kids are in love. Thank you for this recipe! So glad you and the kiddos liked the cookies!